Whether you work from home, in an office, at your kitchen table or in the corner of your living room, the best way to zen out your space is to get it organised. Now that doesn't mean you need to get rid of everything on your desk - you just need to organise it all. After all, invoices, notebooks and washi tape need a home too! As you might imagine as a blogger we spend a fair amount of time sat at our desks or with the laptop on our knees and it's important that our workspaces inspire us to insure that your productivity is at an optimum level. 1. Have a weekly clear out. Don't wait until you have piles of paperwork and product reviews to store away to do all of your desktop cleaning. Keep your desk tidy all year round by spending a few minutes once a week to sort through everything and put objects where they belong or bin anything you no longer need. This could be on a Monday morning so you're ready for the week ahead or perhaps on a Friday afternoon so you have a clean desk ready to start work again the following day or week. 2. Prioritise your supplies. Keep your work space clear by prioritising your supplies. Keep items that you tend to use the most within easy reach, and other items can be stored away to keep your space neat and tidy. To save yourself from wasting time looking for these items when you need them, ensure you store frequently used files, notebooks and pens in your desk drawer or somewhere you can easily access if needed. 3. Invest in storage solutions. If you don't already have a filing cabinet for all of your invoices and blogging related paperwork it's definitely worth investing in one, especially one with a lock to keep all of your personal details and paperwork safe. If you already have one I'd suggest getting some spare keys from somewhere such as Fast Keys who provide replacement office furniture keys as you wouldn't want to have to damage the cabinet by breaking into it if you were ever to loose your keys. You could also buy a desk with a built in draw which is handy for keeping any clutter and stationary out of the way. If you have office space how about some Kallax storage cubes from Ikea for organising your files? 4. Use a planner. 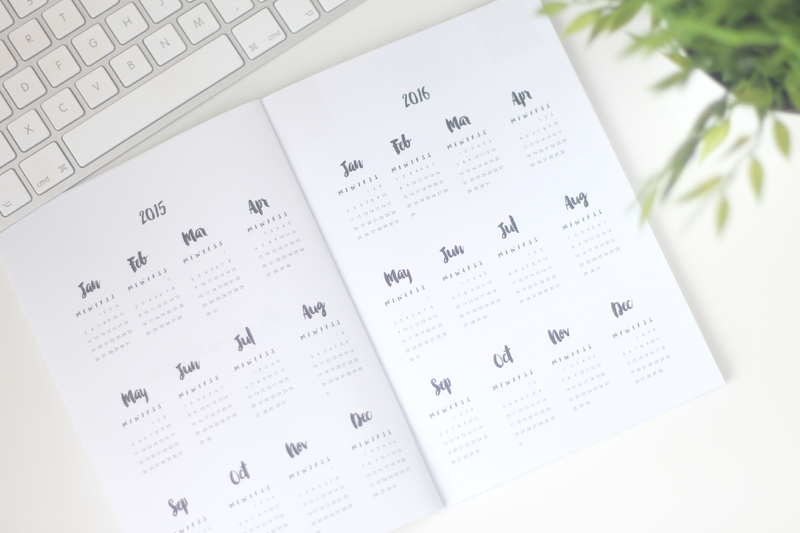 Do you have lots of random post it notes and papers with important dates, deadline, meetings and other reminders written down all over your desk? Try using a personal planner instead to transfer all of this information down as and when your receive it, plus it will save you paper! 5. When in doubt, throw it out. You'll most likely never need 99% of the paper, business cards, pretty packaging or cardboard that you're saving. If you really do wish to keep it, make sure you have a filing system in place to put it where you will know where to locate it at a future date. Remember a clean organised work space will help you get more done and improve your productivity. 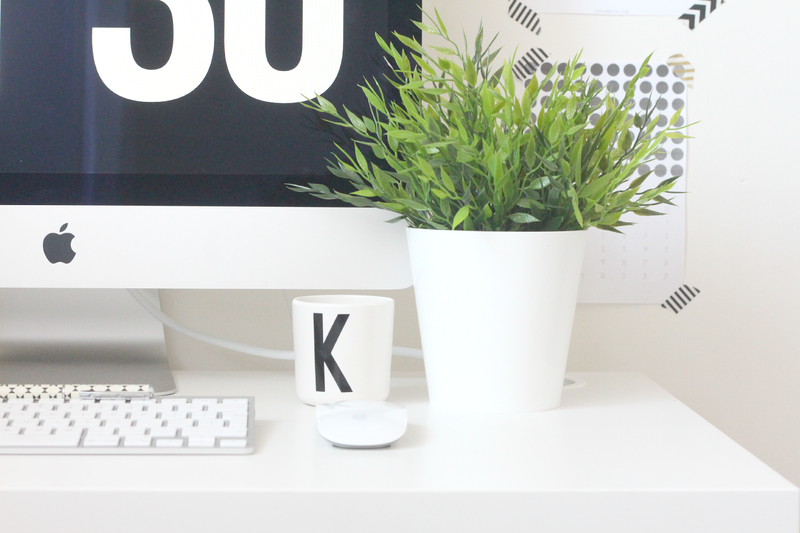 Do you keep your desk clean or are you constantly working amongst clutter? 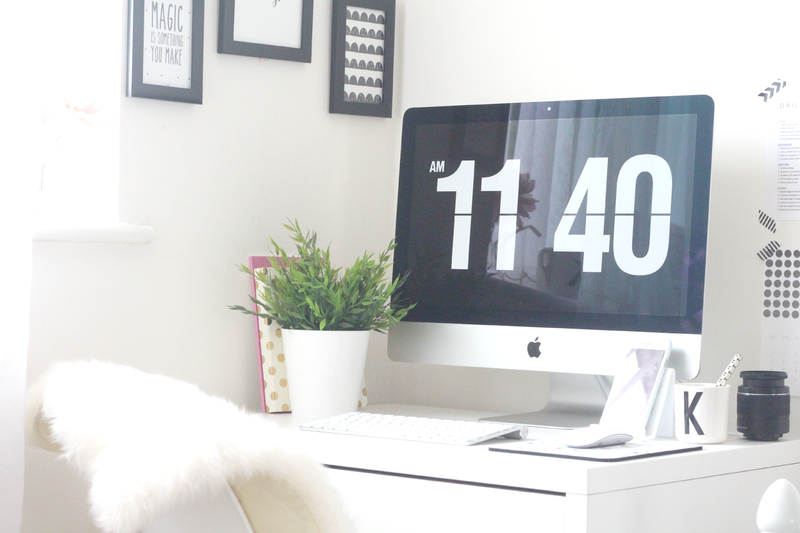 Do you have any of your own tips when it comes to organising your workspace? Brilliant advice! Unfortumately I don't have a blogging space in the house. I normally just have the laptop on my lap and I work on that while rocking the baby with my feet. Great tips, I really need to relaim my office it's become a dumping ground! PS I want your office space! I just love your office space, it's beautiful. I used to have the iMac in the corner of the living room, all lovely and organised. Now it's on my coffee table surround my cups of tea and dirty nappies :/ I definitely need to get more sorted, great tips! I love your work space Kerry it's gorgeous. I need to take in some of these tips, my desk is a mess at the moment. thanks for sharing. See now, I have a lovely workspace, yet I continue to work on my lap/kitchen table/worktop or bed. Always resulting in lost notes and back ache. My lovely bureau remains largely untouched. I must try harder! A weekly clear out is a fantastic idea as sometimes I wait a year before I clear all my papers lol! It is a great way to organize your life. I have a new desk space but as we are still decorating it seems to have turned into a dumping ground for everything! As soon as my living room is finished I will be having a good clear out and keeping up to it on a weekly basis. I love it! These are great tips, the more we stay organized the easier it is for us to accomplish our tasks. My desk is always so messy! I think I need to start having a weekly clearout! These are great tips, I try to keep my desk free of mess but somehow it always creeps back. I honestly think I need more storage! When it doubt throw it out is a great tip. My bedroom is filled with stuff I probably should have thrown out years ago. Your work space is like desk goals! I love how clean it looks and those tips are just great because I'm always surrounded by messy desks. It's like a curse! I'm starting now to use planners so I can get more organized! 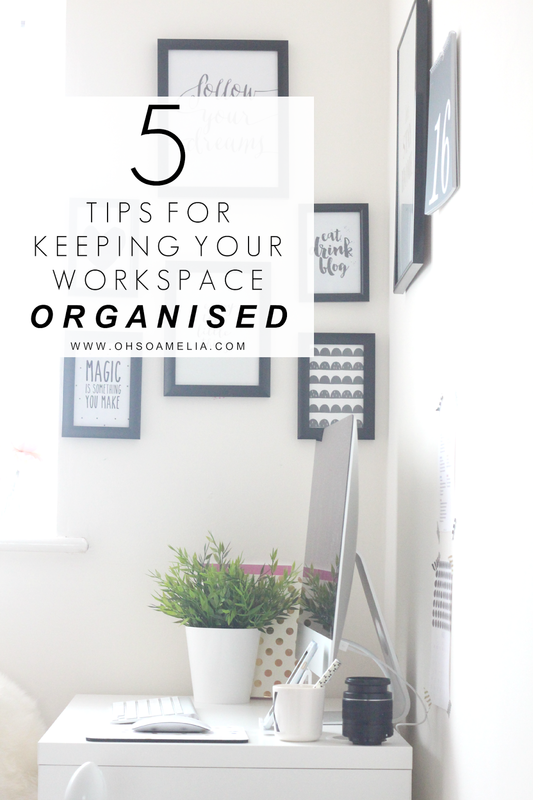 Fab tips - I'm going to be getting a little workspace organised soon and I really need to start off on the right food!! Aww do you have blogers love planner? I have it as well! Love it! I love your desk and computer! Looks amazing! I'm the most unorganised person when it comes to my personal space. Great tips! I'll have to keep them in mind. These are great tips! A clear desk makes for a clear mind for me. I can never start working until my desk is clean and tidy! I think it's because then I have nothing to distract me. I love this post! I love the idea of a weekly cleanout and "when in doubt, throw it out". These are some really good tips I can definitely use! Thanks for sharing. Thanks for sharing with us. Good to know.